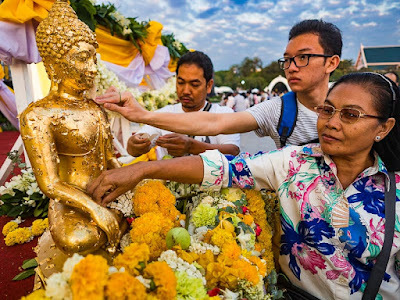 People put gold leaf on a statue of the Buddha at Sanam Luang during the New Year's Day merit making ceremony this morning. Bangkok's New Year's Eve parties become a New Year's Day merit making ceremony right before your eyes. This morning I went down to Sanam Luang, the royal ceremony ground across the street from the Grand Palace for Bangkok's annual mass merit making ceremony. When I left my apartment at 05.00 the nightclubs on our street were still open and their patrons just starting to spill out. A group of monks led a small merit making ceremony in the driveway of one of the trendier clubs while young women dressed in their lbd wandered the street looking for taxis and a ride home. There was a sort of "Blade Runner" vibe to the whole scene. Women pray during the merit making ceremony. 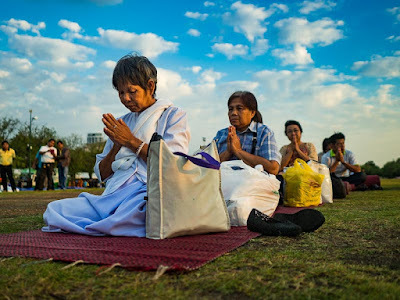 By the time I got to Sanam Luang, the sun was coming up and thousands of people, most dressed in simple white tunics (the preferred color for Buddhist rituals), lined the plaza and participated in a service led by senior Buddhist monks. 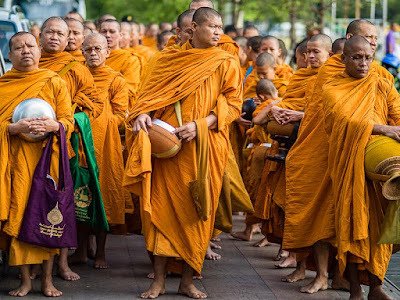 Monks line up for the mass merit making. 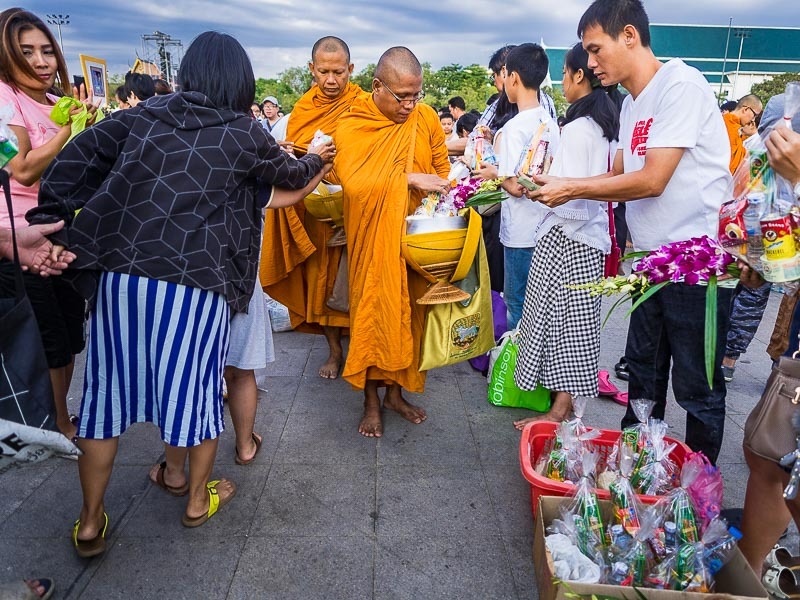 After the chanting ceremony more than 500 Buddhist monks walked silently through the crowd while the faithful gave them armfuls of alms. 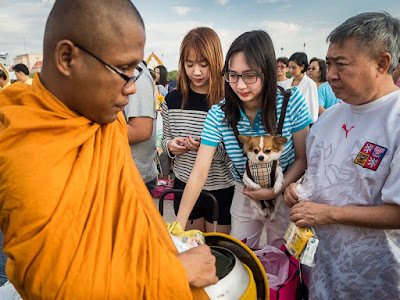 Some food, some cash, some water; basically everything a monk needs. Anything the monks didn't need was donated to charity. People give alms to the monks. This is the fourth year I've covered the city's merit making ceremony. I much prefer it to the raucous parties at Central World and Bangkok's nightclubs. There are more photos from the merit making ceremony in my archive or available from ZUMA Press.